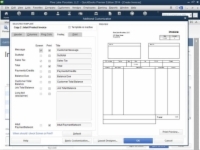 QuickBooks’s form customization tools easily confuse new QuickBooks users. But typically, the way to start any customization is to fiddle with what QuickBooks calls its Additional Customization options. 1Click the Create Invoice window’s Formatting tab and then click the Customize Data Layout button. 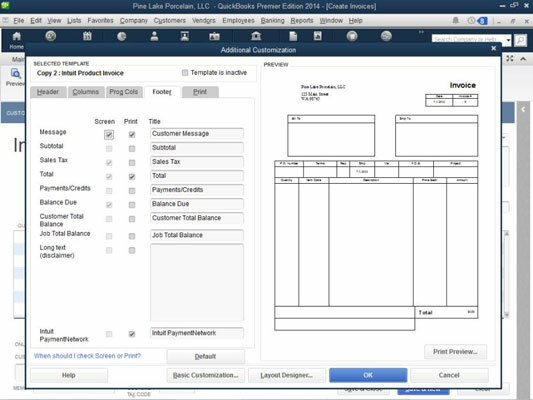 QuickBooks displays the Additional Customization dialog box. 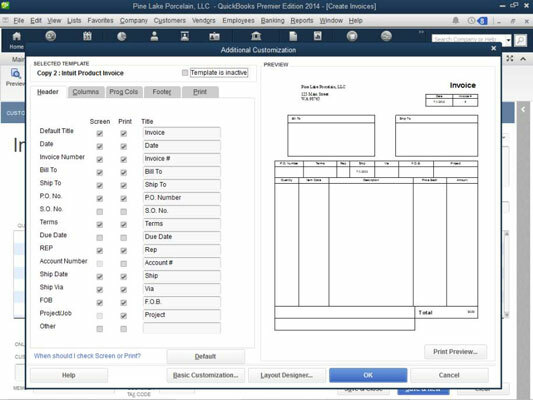 This dialog box gives you control of both the information that appears on your invoices and the way that invoices print. You can’t use the Additional Customization dialog box if you’re working with one of the default invoice templates — only if you’re working with a copy. Accordingly, QuickBooks may prompt you to make a copy of an invoice template when you click the Additional Customization button. The Header tab of the Additional Customization dialog box lets you specify what information goes on the top portion of the Create Invoices window and in the top area of an actual printed invoice form. This information, called the header, provides the invoice number, the invoice date, and the billing and shipping information. You can also choose how information is labeled by filling in or editing the contents of the text boxes. 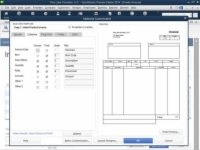 For example, the Default Title check boxes let you specify whether the form title should appear in the screen version of the invoice (this would be inside the Create Invoices window) and in the printed version of the invoice. The Default Title text box lets you specify what the form title should be. 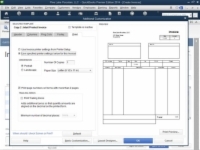 In a similar fashion, the Date check boxes let you specify whether the date should appear on both the screen and print versions of the invoice, and what label should be used to describe the invoice date. The figure uses the clever descriptive text Invoice as the invoice form’s title. As you make these customizations, QuickBooks updates the Preview box, shown on the right half of the Additional Customization dialog box, so you can see what your changes look like. The columns portion of an invoice describes in detail the items for which an invoice bills. For example, product invoice columns describe the specific products, including price and quantity; they also describe the items being invoiced. A service invoice’s columns describe the specific services being billed. As you may guess from looking closely at the figure, the Columns tab of the Additional Customization dialog box looks like the Header tab. You use the Screen and Print check boxes to indicate whether a particular piece of column-level information should appear as a column in the Create Invoices window or in the actual created invoice. Similarly, you use the Title text boxes to provide the descriptive labels that QuickBooks uses in the Create Invoices window and in the printed invoice form. The only unusual option shown in the Columns tab is the Order text boxes. The Order boxes let you indicate the order (from left to right) in which the columns should appear. If the item number or code should appear in the first column on the left, for example, you enter the value 1 in the Item row’s Order box. The prog columns portion of an invoice provides information relevant to situations in which you’re using progress billings. You can click the Prog Cols tab of the Additional Customization dialog box to add and remove such information as the ordered amount, the previously invoiced amount, and any back-ordered amounts. The Header, Columns, and Prog Cols tabs let you make changes to your invoice forms, but don’t get too nervous about making perfect changes the first time. You can easily see exactly how your changes look by using the Preview box (if your eyesight is better than mine) or by clicking OK and then carefully reviewing the new version of the Create Invoices window. If you realize that you’ve made an error — perhaps you’ve used the wrong bit of descriptive text, or you’ve incorrectly ordered the columns — you can customize your invoice again and thereby fix your earlier mistakes. The Footer tab of the Additional Customization dialog box lets you specify what information appears in the Create Invoices window below the columns area and in the actual printed invoice below the columns area. The footer information includes a customer message, the invoice total, payments and credit information, a balance-due field, and (optionally) a longer text box. You work with the Footer tab in the same manner that you work with other tabs. If you want some bit of information to appear, select the Screen check box and the Print check box. To change the bit of text that QuickBooks uses, edit the contents of the Title text box. 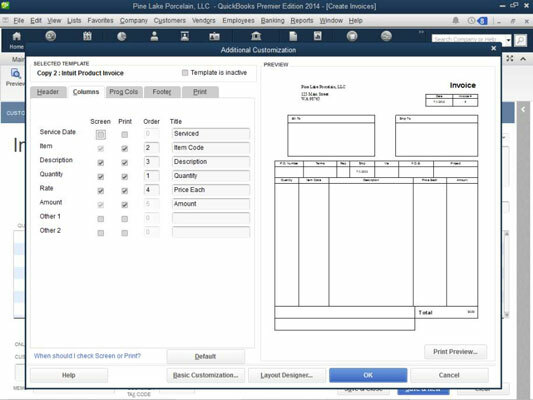 The Print tab of the Additional Customization dialog box lets you exercise a bit of control over how QuickBooks prints invoices that use the template you’ve customized. For example, the radio buttons at the top of the tab let you specify that when printing this particular invoice template, QuickBooks should use the regular old invoice printer settings or other, special print settings. The Print settings also let you tell QuickBooks how it should number the pages of a multiple-page invoice. You can return all the customized invoice settings to their default condition by clicking the Default button. When you do this, however, you remove any changes or customizations that you’ve made.